Qualcomm’s eight-core Snapdragon 810 is a processor worth getting excited about. It’s the 64-bit successor to the Snapdragon 805, 801 and 800 which, between them, have powered all the most popular flagship Android phones and tablets of the past two years. Qualcomm cornered the market with its mobile chips, but has fallen behind recently. The jump to 64-bit has seen Nvidia steal a march on them with the Tegra K1 that can be found in the Nexus 9 tablet, while the quad-core 32-bit variant on the Nvidia Shield Tablet is also a powerhouse. Intel’s Atom chips are also muscling in on the Android tablet scene with some success over the past few months. It’s vital for Qualcomm that it gets the 810 right. Most worryingly for Qualcomm, though, is the abounding rumour that Samsung is planning to pack a all new Exynos processor into its upcoming Galaxy S6 phone for all regions, not just Asia as has been the case so far. We’ve not tested that chipset yet so have omitted it from this article, even though a few potential benchmarks have leaked. We have, however, included Apple’s A8 (iPhone 6) and A8X (iPad Air 2) chips that deliver solid performance. Finally we’d like to note that we won’t be discussing delays, rumours of overheating and other such issues that have been reported about the 810 recently. This is about the benchmark results. We’ve pulled together benchmark scores from products we’ve tested in the past to see how all these processors compare in terms of performance and to find out how the Snapdragon 810 stacks up against them. Benchmarks are only an indication of how well a device performs. Plenty of other factors impact real-world use, such as Android UI layers – we’re looking at you, Samsung – memory read/write speeds and more, but benchmarks are a way of comparing system-on-chips (SoC) like for like. We’ve also had a few cases where manufacturers optimise for benchmarks. Underhand tricks have included boosting processor speeds (at the expense of power efficiency) when a device is being benchmarked. HTC, Samsung and LG have all been guilty of this in the past, however, we’ve not seen this practice repeated recently. All this is why we always advocate waiting until a device is released and reviewed before making too many assumptions about performance. Regardless, it’s fun to play Top Trumps, and it’s great to be able to clear the fog formed of GHz, RAM size and other specs. We took the scores from the test devices – a generic phone and tablet – that Qualcomm provided to benchmark the Snapdragon 810 and compared them to the Snapdragon 801 (via Sony Xperia Z3, Android 4.4), Snapdragon 805 and Exynos 5433 (via Samsung Galaxy Note 4, Android 4.4), Tegra K1 (via Nvidia Shield Tablet, Android 4.4), Intel Atom Z3850 (via Dell Venue 8 7000, Android 4.4) and A8 and A8X (via iPhone 6 and iPad Air 2 respectively). 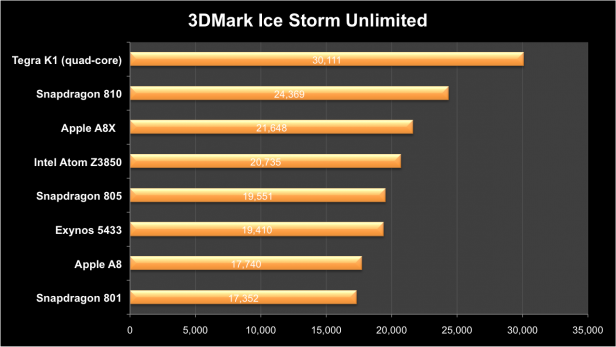 We used three benchmark tests: Geekbench 3, 3DMark Ice Storm Unlimited and AnTuTu 5.X. 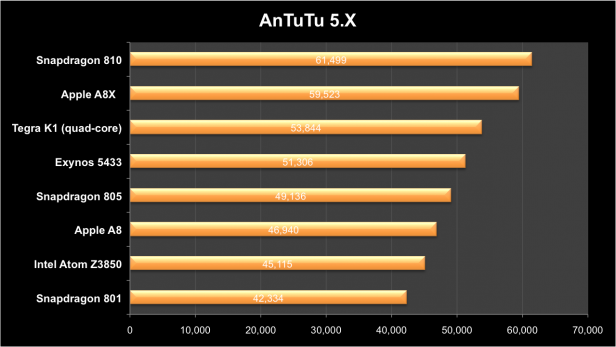 AnTuTu is a popular benchmark tool for Android and, more recently, iOS devices. A range of tests are conducted measuring everything from 2D and 3D graphics to storage, RAM and CPU speeds. AnTuTu then provides an overall score based on these tests. The Snapdragon 810 blitzed this test with a stonking score of 61,499 – only the iPad Air 2’s A8X comes close to competing. That score makes the 810 25% faster than the chip it supersedes, the Snapdragon 805, and 45% faster than the 801. The Tegra K1 comes third with a score that’s 14% lower than the 810’s. This tells us that the is an all-round performance of the Snapdragon 810 is the best we’ve seen in a SoC designed for smartphones and tablets. 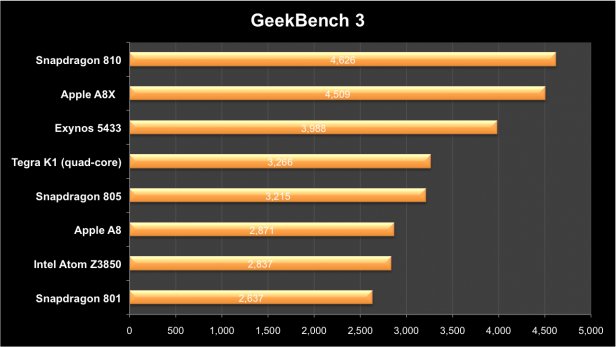 Geekbench 3 is a little different. It focuses primarily on the CPU and all its cores by performing intensive Integer, Floating point and Memory tasks. We’re looking at multi-core scores here to identify, as a whole, which mobile SoCs are the fastest. Once again the octa-core Snapdragon 810 comes out top, closely followed by the tri-core Apple A8X. Compared to the dual-core A8 on the iPhone 6 and 6 Plus though the Snapdragon 810 is a whopping 61% more powerful. With eight cores in tow, the Exynos 5433 flexes its muscles here and comes third – way ahead of the Tegra K1 in fourth. This result tells us that the Snapdragon 810 should be a beast at multitasking. Many won’t need the full power of all eight cores but those that have been designed to take advantage of more than one will run faster, and potentially more efficiently. Our final test is 3DMark’s Ice Storm Unlimited, a graphics-intensive test that measures the 3D gaming performance of a chipset. Surprisingly the Snapdragon 810 comes second here, well behind the Tegra K1 – almost 25% behind, in fact. It’s still well ahead of its predecessors and the rest of the competition, but this could mean that the Tegra is the better gaming SoC. Let’s dig a little deeper though. The Snapdragon 810 scored a huge 33,981 graphics score, but a very low physics score of 12,471. By comparison the K1 scored 35,391 for graphics and 19,811 for physics. In this respect the 810’s scores resemble Apple’s processors more than any others. The A8X on the iPad Air 2 scored 31,476 for graphics and 10,365 for physics. 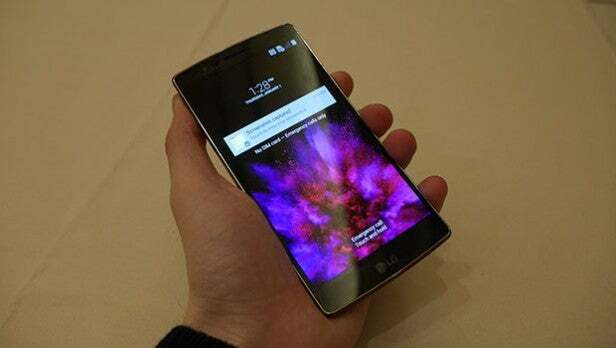 Even the Snapdragon 801, two iterations older than the 810, manages a higher physics score of more than 13,000. Why the big discrepancy? Qualcomm is looking into it after we pointed it out, but hasn’t got back to us with a response yet. It could be a simple case of some tweaks required or it might have something to do with the way 64-bit processors read data. Ice Storm Unlimited uses the Bullet Physics Library used by popular games such as GTA 5. Bullet places memory quite randomly and the 64-bit A7 struggled to jump back and forth to find out what it needed. The A7 was much faster at reading data that’s in order. “To understand this better, it can help to think of device memory as a book. When the words in a book are arranged in order on the page, you can read quickly. If the words of the story are scattered randomly throughout the book, however, your reading speed will be much slower,” explains a FutureMark blog. Could this be why the Snapdragon 810 performs similarly to the A7? The fact that the 64-bit Nexus 9, powered by a dual-core Tegra K1, displays the same characteristics (37,793 graphics/12,252 physics scores) suggests this could be a possibility. This is just a hypothesis on my part at the moment, but 3D physics performance on these devices needs to be further investigated to find out whether it truly has real-world implications in mobile gaming. Nvidia at CES 2018 – What’s New? The Snapdragon 810 looks like a blisteringly fast mobile processor that should provide more than ample performance for the next raft of flagship phones and tablets. It’s the newest kid on the block, so we always expected it to be the fastest, but nevertheless these benchmark scores are hugely impressive.